Don’t panic people. Your favourite drama practitioner is back. It’s been a while, 4 months to be exact but I’m finally sat with enough time to write a little blog about my favourite 3 subjects. Leo, Acting and Moi! 4 months ago I started a glorious little journey back to my first love. Professional Acting. I had all but given up on ever going to the BAFTA’s, ever seeing my double (ok triple) chin on the 42 inch plasma google box in our front room again. I was destined to stay in Horwich, with my life revolving around delivering my son to school and administering the occasional cuddle juxtaposed with trying to change the world, and end inequality through my cheeky little acting school Meladrama. Oh and sometimes I made some stars for my 42 inch plasma TV too. I really wish the ex had taken the TV instead of my pride. Such is life. I had a brand new hot dyke hair cut (in fairness more Pat Butcher than P!ink but I was rocking it), a whole lot to say, and the kinda confidence I haven’t had since it was knocked out of me, again and again. My superb agent took me back after a 3 year break and I got 3 glorious little filming jobs back to back, Cori, Casualty and Hollyoaks and then I off I went to The Almeida Theatre – London for 3 months on the brilliant ‘Little Revolution’. I am on 100% success rate with regards to castings/auditions. To say it’s been the happiest 4 months of my life would be an understatement. Juggling running a business, a house and having to be parted from the beautiful Leo was without doubt the hardest thing I have ever done emotionally, practically and financially. However the pure unadulterated joy I got from working every day as an actress was incredible and a memory I will treasure for ever. I also got to work with some great people. My dressing room pals on ‘Little Revolution’ will be always in my heart. Alecky Blythe, Imogen Stubbs, Clare Perkins and Ronni Ancona. I learnt huge amounts about acting, the ‘business’ but mostly about life and love. I joked that the cast of ‘Little Revolution’ were like a Benetton Advert only grown up. And we did look like that. But us women were part of a working experience that really doesn’t happen very often. Maybe we were older, maybe the mix of class, experience, success….. I don’t know why. But I do know that they took great care of me, inspired me to carry on with my career despite being a mum, infact carry on BECAUSE I am a mum and I will always thank them for that. I am going to blog again soon about the advice I got from them about acting and the lovely Joan Kempson (I play her daughter in a cracking ep of Casualty out in January). I learnt some really cool, helpful stuff from these legends and it’s defo worth sharing (sorry to call you legends girls!). Leo came to work with me several times, the girls loved him. He watched the show, spent a fair bit of time spending my hard earned cash going to see West End shows, met Russell Brand, wrote a play, went to a great play scheme in London and at last got lots of friends from a variety of different ethnic heritages, learnt to speak ‘cockney’ and learnt that he CAN sleep in his own bed without his mummy. He learnt that his mum is far more than just his mum. He always did think I was good at teaching drama and also at looking after him (yes I brainwashed him) but now he knows I have a career too. That a career for a mother is just as important as it is for a father. Leo is fortunately blind to gender. It doesn’t exist in our house unless its to talk about inequality and how we can fix it. But he was breastfed till he was 3 and has always come a huge, loud resounding ‘first’ in our little home. It was a shock for him, but one he embraced and then flourished in. He is proud and we talk with fondness about how silly we were crying at Euston Station – and he recalls with glee all the gifts he managed to manipulate out of me at these times. I have been back ‘up north’ just over a month and since then haven’t stopped. My year long residency as Artist In Residence ended at BCHS with an incredibly brilliantly organised exhibition at ‘Blackburn Is Open Shop’ by ArtistCall. 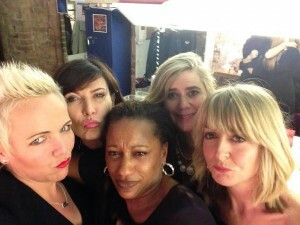 My play ‘Snow White and the 7 Service Users’ was on at The Women In Comedy Festival. I had to ‘go on’ as I lost an actor. He was later found at home so don’t worry but it meant I had to play a Jamaican. Not something Imogen Stubbs ever warned me about. I used a mixture of disabled, amateur and professional actors and wow. It was great. Sold out and 2 pages into the script the theatre booked it for Christmas. I was also chosen a couple of months ago from 100 emerging writers to write a piece for Family Matters produced my Z Arts. The aim being to show a ‘different’ and more realistic but under-represented idea of family. I was chosen because I am gay (you can still be gay and fancy Russell Brand right?) and have created a family for Leo and I from friends. “We’ve been nice to people, they’ve been nice back and now we are a kind of family”. The piece was written from my sons perspective using my sons words and expressions, and was performed by Meladrama Student Toby Sweeton-Dewhurt. He was incredible and it was quite a thrill and very emotional seeing our words brought to life at The Royal Exchange and Z Arts. My two most favourite venues. Right now I am putting the finishing touches to a short play I have written for Integrate. It’s on in November and follows the extraordinary journey of people that were incarcerated 50 years ago for having learning difficulties or mental health illness and then introduced back into the community in Preston by Integrate. It’s an honour to work for them and I am particularly enjoying my workshops with them. It’s such a giggle. You are going to love the song and vid we have done. So what’s next? Well at Christmas we have The Christmas Comedy Sketch shows staring pupils from classes at Meladrama. We are also performing Snow White again and then January sees the start of a year long celebration at Meladrama. It’s our 10 year old anniversary. We are doing 10 plays in a year. Yes you heard that right. 10 shows in a year! Before I sign off I would like to say a personal thanks to Josie Cerise who took the greatest care of my son Leo and Meladrama in my absence. She is currently up at The Dukes (Lancaster) rehearsing for panto. Let’s all go see her? Also the very many ‘aunties’ that helped me manage the last 4 months and continue to make it possible for me to do a job I love and have a happy home. These are Auntie Netty, Auntie Charlotte, Auntie Paulina, Auntie Faye, Auntie Lucienne, Auntie Claire, Auntie Michelle, Auntie Olivia, Auntie Julie, Auntie Abi, Auntie Karen, Auntie Zena…….As my 6 year old told me ‘mummy, you are the best mummy but my aunties were very good at getting me to school on time and also brushing my hair, and helping me get all my spellings right’. Yes sunshine – that’s why I chose them to be your aunties. Aren’t you a lucky boy now get your lines learnt – you are playing John Cleese in The Christmas Comedy Sketch Show. Yea I know you are only 6 but you can do anything if you believe in yourself sunshine…..